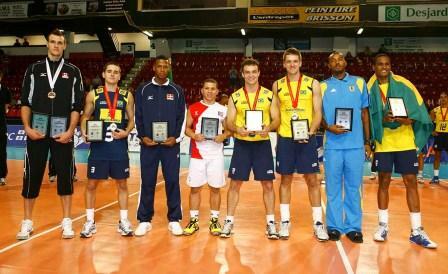 GATINEAU, Canada, June 18, 2011 – Brazil’s Paulo Silva, who scored 23 points to lead his side to the victory at the gold medal match, was selected as the Most Valuable Player of the Men’s Volleyball Pan American Cup on Saturday. Silva was one of four Brazilians who received individual awards during the closing ceremony of the competition at Centre Robert-Guertin in Gatineau. The other awarded members of the gold medal winners were Lucas Provenzano, Raphael Margarido and Thiago Sens as best digger, setter and receiver respectively. Canada’s Gavin Schmitt took home the awards as best scorer and best spiker while Bahamas’ Byron Ferguson was the choice as best blocker. Dominican Republic’s Pedro Luis Garcia and Puerto Rico’s Jose Mulero were selected as best server and best libero respectively.